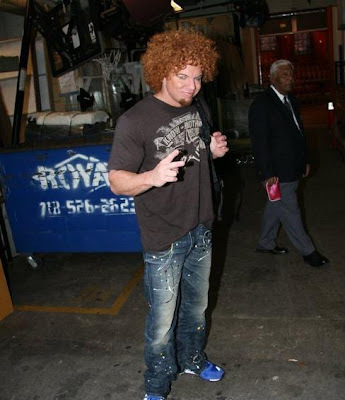 Carrot Top looks like he just left the beauty parlor with Midge, Honey, Perl, and Mildred after the girls all got their hair set in rollers and then blown out. They have a big night at the BINGO hall and some new Troll dolls to test out for good luck. B5? Is there a BINGO in the hall? Seriously, what in the holy F is a matter with this guy? 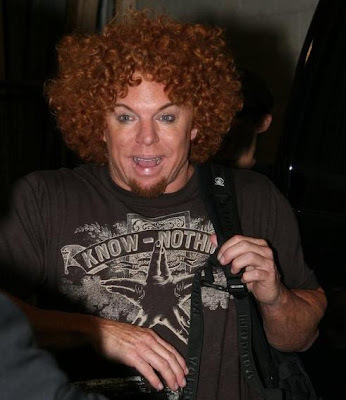 Carrot Stop was photographed leaving Regis and Kelly yesterday and made sure to frighten all those who asked him for his picture. Ironically the Iranian dude in the background holding the red satin purse doesn't seem to be phased by the fact that Carrot Stop is standing there, the paparazzi are flashing their cameras, or that he is actually carrying a red satin purse. Wait, is he signaling jihad? Ok, I think I hit all the major stereotypes I needed to. That'll be all. Why does his face look so weird? Does he wear makeup? He is painful to look at. AHHHH WTF IS THIS MESS? ROFLMFAO!!! That was great! Thanks I needed that laugh IBBB!